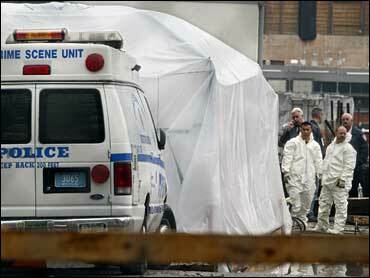 Workers found yet more human remains at the World Trade Center site Saturday during a renewed search for 9/11 victims. The city began a new search after a Con Edison crew made the surprise discovery of body parts earlier in the week while excavating a manhole near the southern edge of Ground Zero. The human remains found on Saturday were located in manholes along a service road on the West Side of the World Trade Center side. Utility and city officials hand-removed material from other manholes after tearing into the pavement on a service road along the site's western edge. It was then sifted onsite by forensic officials for fragments of human remains. Nearly 100 fragments of human remains have been found this past week. Relatives of the 9/11 victims demanded that the city stop construction and concentrate efforts on a thorough recovery of human remains. Some called for the federal government to lead a new search. Charles Wolf, who lost his wife on 9/11, hoped that construction would cease until all remains have been recovered. "The construction workers themselves ought to voluntarily say, 'I am not going to construct anymore until we find the rest of these body parts,'" he told WCBS-TV. Corin Clifton, a visitor to the WTC site, does not think the building process should be stopped. "We lost loved ones," she told WCBS-TV, "but they now became part of history. So their souls are going to be here forever. So, rebuild." More than 1,100 victims of the World Trade Center attack remain unidentified or their remains haven't been recovered. The city on Friday had expected to look through about six manholes and subterranean pockets, but the search was expanded to 10 after utility maps and other tools showed there were more cavities than previously believed, and will continue throughout the week, officials said. The 80 bones and fragments found Thursday ranged from a little less than an inch to 12 inches long, said Ellen Borakove, a spokeswoman for the city medical examiner's office. The bones possibly include ribs, arms, legs and vertebra, she said. The work earlier this week on the service road is part of more extensive construction of a 1,776-foot skyscraper, transit hub and memorial on the 16-acre site. The active search for the dead ended at the site in 2002 after a massive cleanup of 1.5 million tons of debris. About 20,000 pieces of human remains were found, but the DNA in thousands of those pieces was too damaged by heat, humidity and time to yield matches in the many tests forensic scientists have tried over the years. More than 40 percent of the 2,749 Sept. 11 victims in New York have never been identified. Some relatives of the dead have asked for the city to enlist the help of a military unit known as the Joint POW/MIA Accounting Command, which specializes in finding and identifying the remains of missing troops. The mayor's office said in a message to the families Saturday that two experts on the city's forensic team are former members of that unit. They "have advised us that the command's expertise is searching for missing soldiers, not bone fragments. We have the best possible people working through the weekend on this effort."